Today we are going to look at some more kettlebell training that you can add to your fitness routines. Building a strong, powerful back is not only aesthetically pleasing but reduces your chance of injury in daily activities. A broad back also just screams power to anyone who ends up walking behind you. While this is one of the best exercises there is for blasting your lats, if you have any history of back problems you should consult a physician and make sure it is ok to include this lift in your training program. When performing this lift, your arms should form a 45 to 90-degree angle with your body. As you are pulling the weight towards your body, concentrate on bringing your shoulder blades together and pushing the chest out. Keep pulling until your elbows move slightly pass the torso. Hold in this position and squeeze your back muscles for one to three seconds. 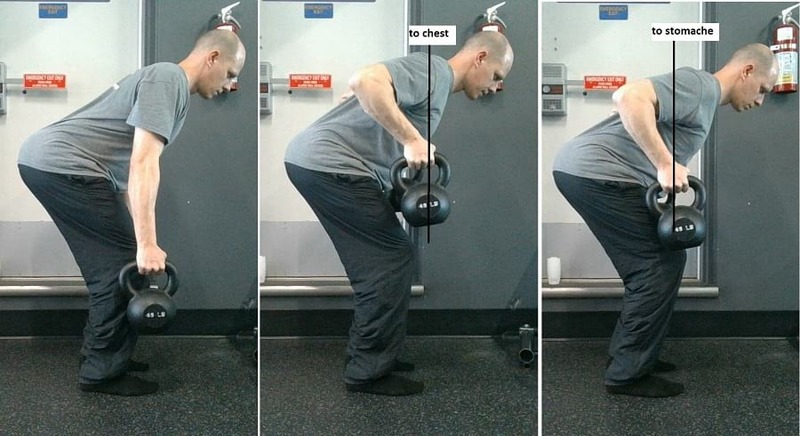 Step 4: Use a slow and controlled movement and lower the kettlebells back down. Congratulations you have completed one repetition of the Kettlebell Bent Over Two-Arm Row. Repeat for the number of reps you have selected. The Two-Arm Kettlebell Row is a strength training exercise that gets rated at an intermediate difficulty level. As the title states to perform this variation of rows, you are going to need a pair of kettlebells. However, you can perform the same exercise with dumbbells or a barbell if you do not have access to a pair of kettlebells. 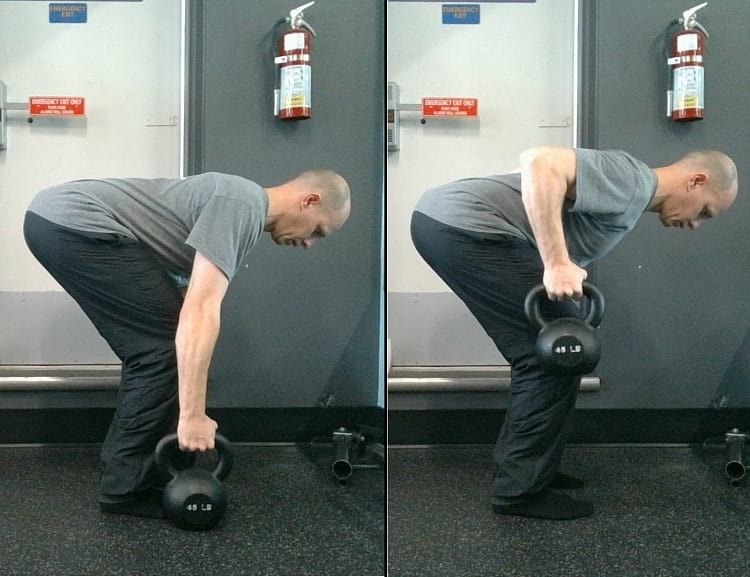 The bent over row works many muscles in our back. The primary muscles targeted in your back are the trapezius and the rhomboids. The deltoids(responsible for the rounded look of your shoulders) and latissimus dorsi are the primary muscles in the shoulder used. The secondary muscles in your shoulders used are the infraspinatus in your rotator cuff, the teres major(supports the latissimus dorsi), and our pectoralis major(pecs). Your chest works as a stabilizing muscle During the lowering of the barbell. Your Biceps are the primary arm muscles that get worked by this lift. The biceps control the flexion in our elbows when we pull the barbell towards our body the biceps contract. When lowering the weight, our triceps are acting as the stabilizer muscle. Many of us spend a lot of our time hunched forward when we are driving home, watching tv or working on the computer. Building our back with lifts like rows helps our body pull the shoulders back naturally, helping to reduce and sometimes entirely correct our forward hunching posture. Bent over barbell rows work the opposite muscles to the bench press. Using rows will help you prevent developing muscle imbalances between our pushing and pressing muscles. Always make sure you are completing as many sets and reps with your rows as you perform with benchpress to prevent forward hunching posture. Rows are a Compound exercise that work multiple muscles groups together training them to become stronger as a unit. Since many muscles are involved with this lift, you will burn a significant number of calories while you are performing it. Lifting heavy will also set your metabolism to burn a higher number of calories for up to 48 hours after you have completed the exercise. Make sure that you focus on using your back muscles to move the weight towards your body and not the biceps. Focus on squeezing your shoulder blades together as you are pulling the weight. Keep your elbows tucked in close to your body. Having your arms in this position will help to recruit your back muscles while you are pulling the weight. Your breathing is important. Make sure that you exhale as you are pulling the kettlebells towards your body, and inhale while you are lowering them back down. If you feel pain in your lower back from the traditional version try using the Yates(body forms a 45-degree angle) variation since it places less strain on your lower back. CrossFit exercises get separated into three different categories(gymnastics, metabolic conditioning, and Weightlifting). If you are designing a Crossfit routine and want to include this exercise, it gets classified under the Weightlifting category. The exercise works very well with either a set number of repetitions or for a specific duration of time. With either method, make sure your form does not deteriorate. Once your form begins to break down, stop performing this exercise. Performing the exercise with proper form will reduce your chances of receiving an injury. Building a strong back will reduce your chances of getting an injury in the gym and throughout your daily tasks. It will also increase your performance in the weight room while making you better aesthetically. Remember to perform rows the same number of times(or more, preferably two to one) you bench press through the week. Performing rows will help prevent you from developing any muscle imbalances between your pressing and pulling muscles.